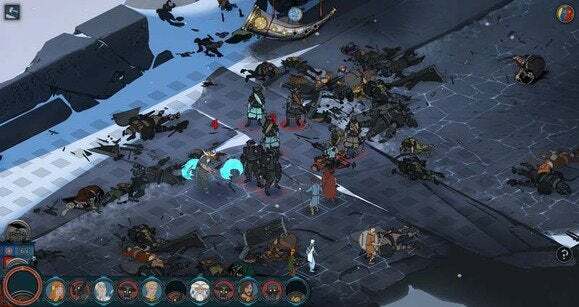 The Banner Saga started out as a Kickstarter project and in 2013 the developer delivered a free-to-play multiplayer component of the game entitled Factions. 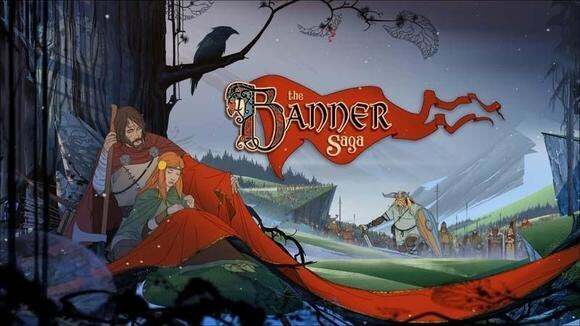 Now they have given us the chapter one (of a planned three) single-player story simply called The Banner Saga. 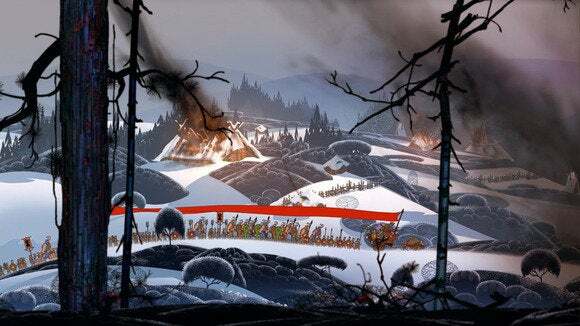 Enter a world inspired by Viking legend. The gods are dead and the world is slowly crumbling. Humans and the horned giants known as Varl work together to fight against the invading Dredge menace and simply survive the harsh landscape. There is a lot of lore here to explore if you want and the many characters are intriguing. Greater things are hinted at for future chapters, but there is a very satisfying 8 to 10 hour journey to be had here. Even better, the story and characters change based upon your decisions so you can replay it two or three times and get different events and endings. Gameplay is broken up into three main sections: travel, decision-making, and combat. Travel is clearly inspired by The Oregon Trail as you watch your caravan cross the lands in a side-scrolling fashion. Every day uses up supplies that you generally obtain through towns and cities. You can also stop and rest at any time, which heals warriors and boosts morale, but uses up precious supplies. The caravan will frequently stop to deal with problems, character interactions, enemies, and more. This is mainly where decision-making and dialogue show up. Decision-making is always tense and engaging. A certain choice or lost battle can leave a major character dead or see you wandering the wastes starving and losing caravan members. Yet others can have you gain magical artifacts for combat or extra supplies. These events are evenly spread out and feel balanced—important to our experience. Combat is a turn-based affair. A simple-yet-effective system governs combat mechanics. Every character has different strength and armor values. Strength also serves as health, but armor must be whittled away before damage can be done directly to enemies. The strategic elements come into play via the numerous different character classes and special abilities. Characters can also be upgraded via Renown points that also serve as the game’s currency, so you must spend them wisely. We found the difficulty suitably challenging throughout and never too hard. Our only surprise with combat was that characters are merely wounded when they fall in combat, not killed. Occasionally you will go into War mode. Here you must make different tactical decisions before entering combat, and you can even opt out of direct combat by managing the battle from afar. This will cause you to lose more fighters, but it can be done. What team Stoic has accomplished on a budget is breathtaking and easily redefines what a good-looking game means. The hand-drawn visual artwork and animations are stunning and will easily pull you into its fantasy world. I have never been so drawn into a 2D game before and Stoic creates a fantastic atmosphere to play through. Special mention should go to Austin Wintory for creating an epic soundtrack that is suitably grand or haunting when it needs to be. 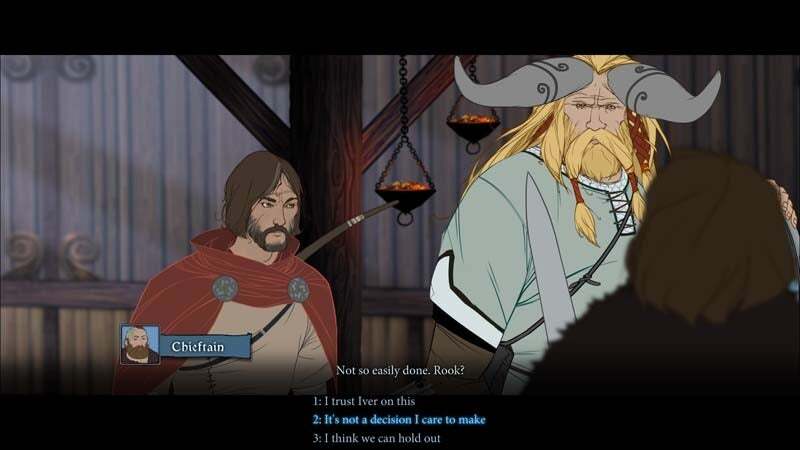 The Banner Saga should run on almost any modern Mac. The requirements are low and the game is definitely not performance heavy. We encountered a few minor bugs over multiple runs of the game but nothing that could ruin or hinder our experience. The Banner Saga is one of the best-looking games you will play all year. It is also an engaging and fun RPG with high replayability that will leave you eager for the next chapter.